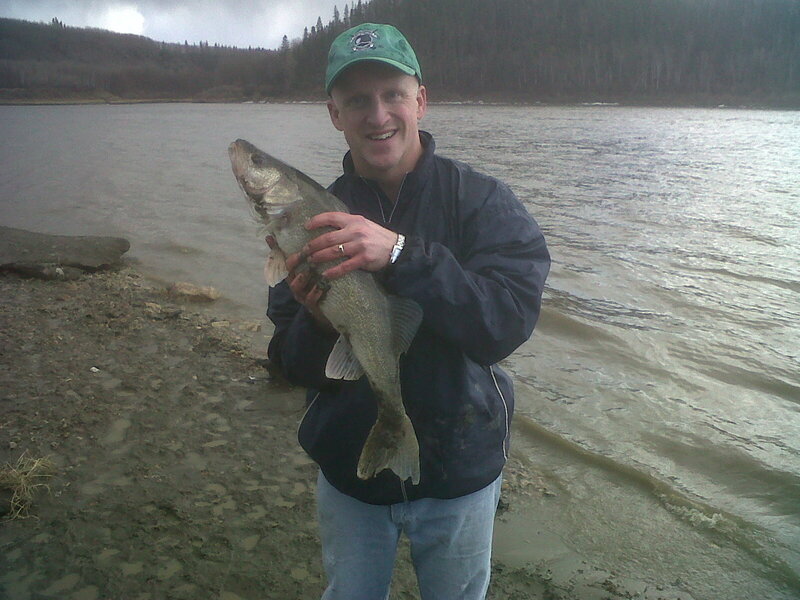 After a long winter, there is nothing more exciting to me than hopping in my Ford Escape, with fishing gear piled in the back, and driving down the water treatment plant road to our fishing spot on the Athabasca River. I had my first chance to do that on Sunday after the close of The Farnsworth Invention - the need to feel the warm sun on my face and the splash of water on my toes almost overwhelming. I wasn't alone in my longing to get on the water. Five or six vehicles spotted the long and accessible beach located just south of the water reservoirs. Honestly, I don't know what the official name is for this spot, whether it's "Fisherman's Landing" or "Fisherman's Point" - it doesn't matter. We refer to it as the "water treatment plant". Ben came along for the ride, wanting to do some panning for gold, as he goes through a rather inspired rocks and minerals phase. 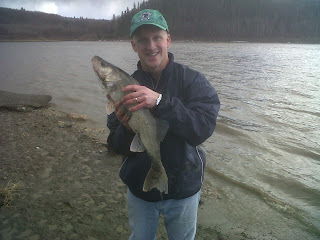 So, while he darted for the water, I strung up my pickerel rig, put on minnows, and tossed it out about 30 feet. It wasn't too long before my rod began to decidedly twitch. 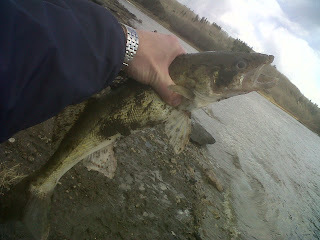 Within minutes I had landed a healthy looking walleye. 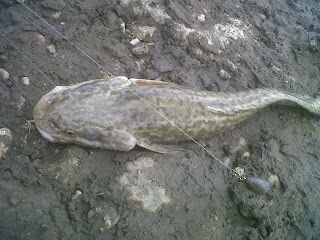 A modestly-sized burbot followed closely thereafter, a very different kind of strike, stealthy, barely perceptible - additional weight that magically appears on the end of the line. 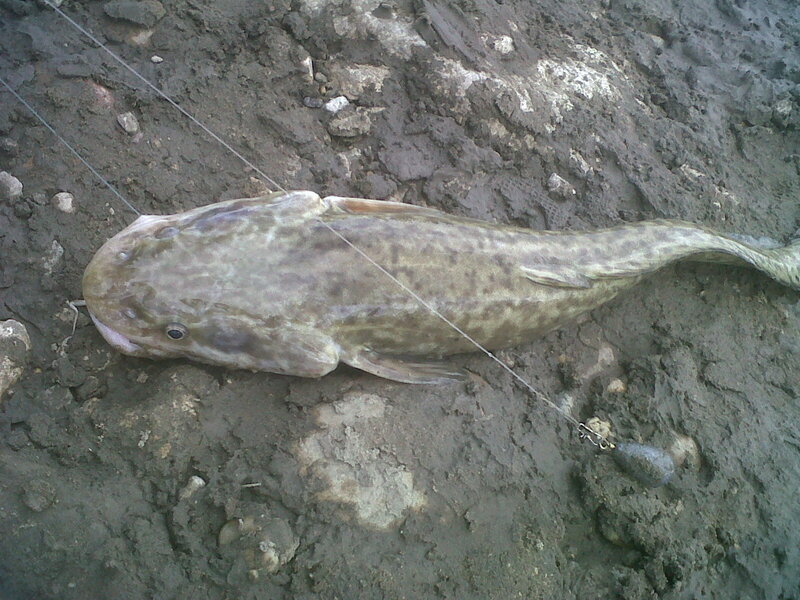 "I've never seen one of those," said one fisherman, running over to see the fresh water ling cod, complete with whiskers and a slippery scaleless eel-like body. 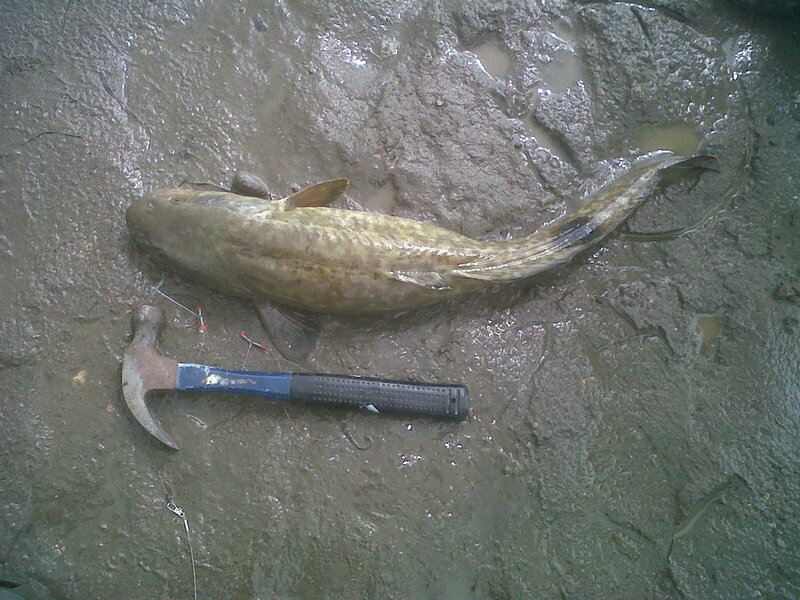 Another smaller walleye was quickly followed by a burbot that was substantially larger. To get a sense of scale I placed a hammer alongside its body. You can keep 10 of this species, according to the regulations. But, despite Len's assurances that they taste pretty good, I haven't taken any home yet. Apparently, you need to hammer the head to a tree or board so you can peel off the skin. It's a different kind of fish, that's for sure. The rain clouds that had been circling for an hour or so, finally let go and we nestled under the hatch to stay dry. I was about ready to head home when the rod dipped again. Owing to the amount of organic debris in the water at this time of year, bits of grass and leaves that get caught on the line, I was finding it impossible to gauge the size of the fish that I was dealing with. I was forced to stop several times to untangle all the detritus before continuing. 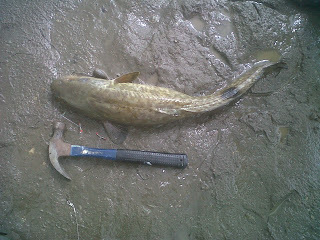 So, I was rather surprised when this latest catch eventually found its way to the shore. 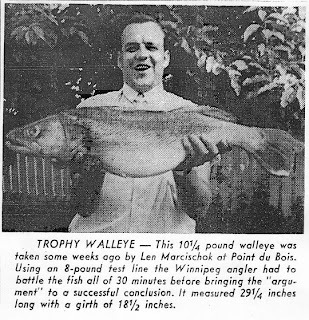 It was a mighty looking walleye. At 7 pounds even, I think it was the largest of that species that I've ever caught. You could tell that this was something special, as anglers ran over, iPhones in hand, snapping shot after shot. 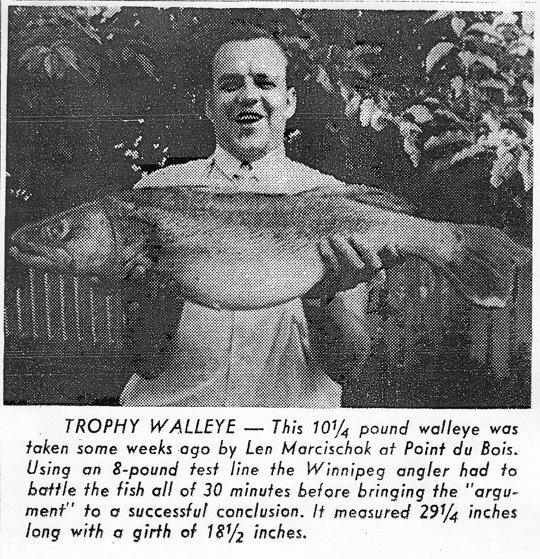 You don't see big ones like this very often, though Len recalls catching ones double the size in his younger days, and yes; he has pictures to prove it. By the time Ben packed up his rocks and my fishing gear was stashed, two hours had passed, and six fish had been landed and released. It had been an awesome start to the fishing season and much needed respite from what had been a rather harried stretch in my working, political and community life.